There may be many developments going on in solar power with larger companies these days, but a small Texas-based company--HelioVolt Corporation--has come up with a new patented technology that will allow it to manufacture CIGS-based photovoltaics more cost effectively, and with greater flexibility. It's a new world out there in the solar power industry, with solar panels thinner than a human hair now generating electricity from sunlight. These panels, better known as photovoltaics (PV) devices, have until recently been predominately made from silicon. But now companies are also using a combination of copper, indium, gallium and selenium (CIGS). And a small Austin, Texas-based company, HelioVolt Corporation, has come up with a new, patented technology to manufacture CIGS-based photovoltaics faster, more cost effectively and with greater flexibility. The new trademarked FASST (Field Assisted Simultaneous Synthesis and Transfer) process involves printing a fine layer of semiconductor directly onto glass, metal and other building materials so that everything from skyscrapers to single-family homes, can be built already solar powered. "This is a very unique method," explains John Langdon, the company's vice president of marketing. "To make an analogy to the printing industry, we're making the Gutenberg press right now. It prints one page at a time. But in the long run it will look like a big web press at a newspaper--multiple copies running at high speed, one right after the other." Billy J. (BJ) Stanbery, president and CEO of HelioVolt, is the mind behind this new process and the company. While employed at aircraft manufacturer Boeing, he registered seven patents in thin film PV device technology, and designed, manufactured and successfully deployed photovoltaic devices for spacecraft. Stanbery believed CIGS was an excellent choice to replace silicon. But despite lower material costs, current methods for manufacturing were too slow to ever make it competitive with hydrocarbon generated electricity. "Although Stanbery already had degrees in math and physics, he went back to get his Ph.D. in chemical engineering to help him find the answer," explains Langdon. Stanbery succeeded in finding a solution--and founded HelioVolt in 2001. For the next five years the company developed technology and secured patents. Money is being raised to build the first factory in 2007 and the new PV devices are anticipated to reach the market in 2008. 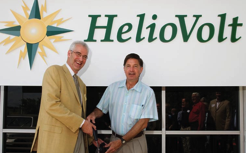 HelioVolt Corporation has been receiving plenty of media attention: The company's FASST (Field Assisted Simultaneous Synthesis and Transfer) was named as one of Time Magazine's "Best Inventions of 2006" and it won a Silver Wall Street Journal Technology Innovation Award. HelioVolt doesn't feel threatened by the current silicon market. "Silicon is abundant, but the refining process is expensive," explains Langdon. "The silicon market right now is selling everything it can make and can't meet the demand. So companies like ours--that use something other than crystalline silicon--have an opportunity." There are a number of advantages to CIGS over silicon. "It is only 1/100th as thick, can absorb the same amount of light and is pennies on the dollar compared to the cost of silicon," says Langdon. "FASST is very flexible. It can be applied to different surfaces--glass or metal or plastic. And it can be applied in different sizes and shapes, which is difficult to do with crystalline silicon." About 90 percent of the PV panels today are retrofitted on existing homes and buildings. And that's likely to be where HelioVolt's products will be first used. But HelioVolt sees this as the first steps to a larger market. Langdon likens PV tape today to the air conditioning market in 1949: "If you wanted an air conditioner, you bought a window unit, designed to go with existing homes. Now the window unit is about two percent of the overall market. "Today's solar market is a $15 billion market, and in the long term that portion will only be that two percent of the market. The part of the market where photovoltaic coatings are built into the buildings as they are constructed will be by far the larger piece." What will be the next steps? Because of the company's flexibility in the manufacturing system, it foresees making products for the "building integrated market"--applying PV coatings to construction materials, which are then installed when the building is built. "That eliminates some of the duplication in cost and makes the whole thing a much more economic proposition," says Langdon. HelioVolt estimates that within as little as five years, you could choose a solar-powered roof as one of the options when building a home. There are a number of reasons the U.S. and other countries will look to solar power in the future as it becomes more economical. One big benefit is that it will help offset those peak grid usage times. "Peak demand for electricity is normally between 2 and 6 p.m.--near the times when the most solar resources are available," says Langford. "For many commercial buildings, the electricity they buy in the afternoon costs more per unit than the electricity you buy at night. So the PV has the effect of shifting a bigger percentage of your bill into the cheaper night time electricity." For utilities, being able to reduce the pressure at those peak times will mean not having to rely heavily on expensive generating plants used specifically for those peak hours. Nor will they need to build the costly plants in the future. Solar power could also eliminate the cost of power transmission over long distances. For those and other reasons, HelioVolt sees the utility companies as its largest customers in the future. Langdon feels confident in his company's predictions because German and Japanese markets are already much bigger solar markets than the U.S., primarily because their electricity is much more expensive. In Japan, solar is already the cheapest way to get electricity. Add to that the low maintenance (no movable parts), no fuel needed and no emissions and you can start to see its appeal. "But in the long run, the U.S. is a much bigger solar market than either Japan or Germany," says Langdon, "It has more solar resources and it has more homes and buildings that want to buy electricity. So in the long run, the U.S. should be a huge market for solar." One might think that PV systems would only be popular in places like Tucson, Arizona--which is one of the best solar generating spots in the U.S. because it receives the most sun and the least amount of cloudy days. HelioVolt Corporation president and CEO B.J. Stanbery (above, left) with Austin, Texas Mayor Will Wynn at the dedication of HelioVolt's new Austin facility. The company is raising funds to build its first factory in 2007, and its thin film photovoltaic solar power cells manufactured from copper, indium, gallium and selenide are expected to reach the market in 2008. But despite the wide range of solar resources available--with sunny Tucson generating 130 percent of its needs and a cloudy Seattle generating only 15 to 20 percent--the PV systems will be capable of providing on average about 50 percent of the energy required for all homes and buildings in America. 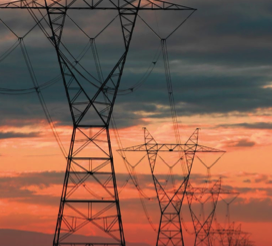 "The vast majority of the growth in the market today is the grid-connected installation. When you generate more than you need you essentially turn your meter backwards and sell it back into the grid. And at night when the solar doesn't generate anything, you draw whatever you need from the grid at its cheapest rates," says Langdon. But companies like HelioVolt have to look much farther ahead to see if there will be a continued a market for their technology. So far, though, the future keeps looking brighter and brighter. "The prediction is that electrical rates will go up and people will be charged by the time of the day, so they will really want to reduce the peak demand," says Langdon. By 2015 and 2020 HelioVolt predicts that solar will be the cheapest way to generate electricity. "I think it will actually be less expensive than coal or nuclear or anything else. And at that point the photovoltaics will be a big percentage of the overall electrical generation in the U.S." Langdon goes even further out on a limb with his predictions. "I don't think we'll actually have hydrogen powered vehicles until such time as PV electricity gets inexpensive enough to make hydrogen from water." One of the reasons for his optimistic view is that as fossil fuel prices continue to rise, solar power continues to become less expensive and more reliable. The cost of solar is about one-tenth of what it was 20 years ago and it continues to drop. "In places like Japan, solar is cost competitive with fossil generated electricity. In the U.S. it may be a few years before that's true," says Langdon. "And as solar power grows in usage, it will only be a matter of time until a market will develop where places in the sun can simply use the grid to ship their excess electricity to places that need it. "Companies are already starting to accumulate carbon credits. It will be interesting to watch this develop. I've been told by several people that are in and around the government that the value of the carbon credits for the solar electricity may be worth more than the electricity itself." The challenge for HelioVolt now is to hire the number of skilled individuals necessary to run the new factory. Currently it employs 22--mostly engineers and scientists. But as it begins building the factory, it will have to hire three to four times that number in manufacturing engineers, technicians and equipment operators. The new factory will be located in North America, and although the exact location hasn't been selected yet, they do know that it will require light industrial zoning, use much less water and hazardous chemicals than a typical semiconductor fab, and will need 80,000 to 100,000 square feet of space, allowing room for further expansion. "We will be producing 15 megawatts per year of peak generating capacity," says Langdon, although it will be somewhat less than that at the start. HelioVolt is excited about its future. "We have a very complete portfolio of patents protecting us," says Langdon. "It's going to be very difficult for anyone else to do anything like this."